In my work, as in the work of many people, I imagine, there are themes that come up again and again. Sometimes I get asked a question and I can point to a blog post I wrote or an article I read months or years earlier that touches on the same subject. Little kids have some very consistent interests; it’s why certain toys remain popular for generations. Building toys are one of those evergreen entertainments; kids can play with Lego or magnet-tiles forever, it seems. 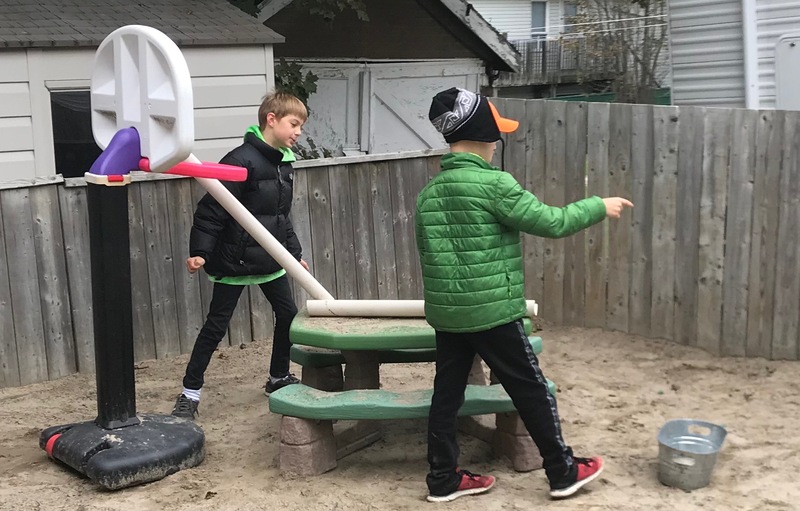 In general, my attitude towards the “problem” of repetitive play has been to encourage educators to look more closely at children’s play, to observe with a curious eye and to wonder about what they might be missing. In short, my approach has been to push back against our perception that there IS a problem at all. Often, when children return again and again to the same materials, they’re trying to figure something out and it’s our job to value what they’re doing enough to discover and support the intentionality of their play. However, there are some times when repetitive play really is something to be concerned about and it’s worth spending some time thinking about how we might structure the environment and our interactions with children to support expanding their repertoire of play behaviour. Recently, I was working with a teacher who was distressed by the repetitive play she was observing in her classroom. A group of boys consistently chose to visit the Lego centre and exclusively created spinning toys that they then “battled” against each other to see which one could withstand colliding with the other spinners. They resisted choosing any other material or building any other type of structure. It had been months of repeating the same play behaviour and they were unfazed. The teacher had tried her best to extend the play towards an investigation into rotation, more broadly, but they were unmoved. The Beyblades continued to duke it out. When I began observing their play, I positioned myself right in the centre just to see what effect my presence would have. Sometimes, just having an adult body in the space is enough to shift the play subtly. It didn’t work in this case, the boys just moved the play away from me. Not to be deterred, I followed them and began asking them questions, essentially being a brat. Essentially I did my best to make their play a bit uncomfortable by being, politely, annoying. At the same time, I was building with Lego myself, struggling to make something as unlike a spinner as I could. They were, as I had suspected, up to the challenge my behaviour created. Slowly at first but soon with increasing enthusiasm, their play changed. Some of them began building other things, others drifted off to other areas of the classroom. Suddenly the marble run came out and building took off in that area. Those that had stayed with the Legos began creating patterns and characters, building houses and stories. Did I commit the cardinal sin of play-based-learning here? Is changing the play because of an adult agenda against the rules? That’s definitely up for debate and you might disagree with me in the comments. The reality is that we work in a system that places certain demands on us related to assessment and reporting. When children’s play is especially repetitive, it’s hard to write report cards. What are our next steps? It’s also true that we’re seeing, anecdotally at least, that children are coming to school with less play vocabulary than we would have expected in the past. Due to the ubiquity of technology, concerns about safety and other societal pressures, their exposure to materials, to outdoor environments, and to other children is often less robust than that of children from previous generations. They may genuinely struggle to know how to play with the diversity of materials and contexts we’re offering in a Kindergarten class. So while it may not fall within the paradigm of purely emergent curriculum, I think there is some value to modelling and disrupting play that has become rote. Some adult intervention in certain moments, when the play has been closely observed and other interventions (changing the environment, for instance) have been tried, does help to move the learning forward. One of the biggest things I learned from the RECEs I’ve worked with is that an adult, working in role in the play space, can often help children succeed in the classroom better than any behaviourist intervention. Erica McWilliam, in her 2009 essay “Teaching for creativity: from sage to guide to Meddler” suggests that adults should be “usefully ignorant” as they meddle in students’ learning to nudge it forward. Sometimes that looks like asking some annoyingly dumb questions. Sometimes it looks like building or drawing something yourself and wondering aloud how to make it better. Sometimes it looks like wearing a funny hat and pretending to be a flower. 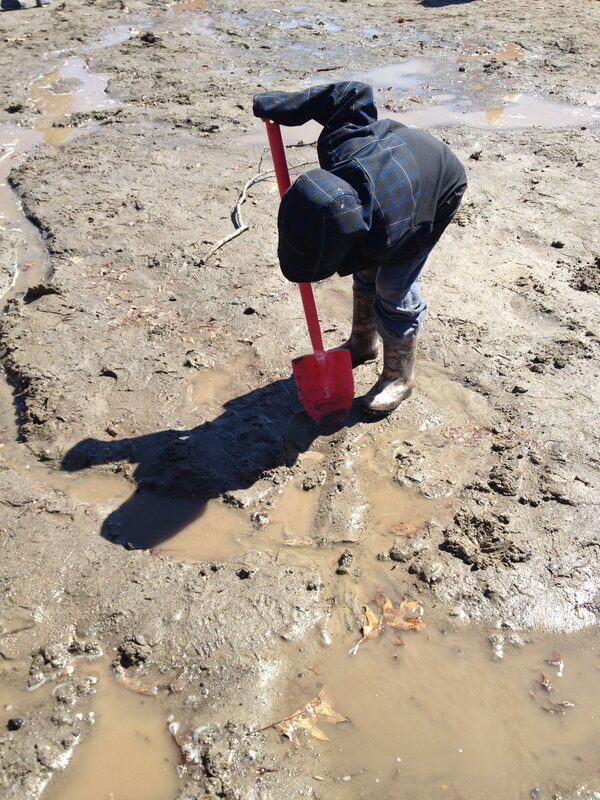 Our work, sometimes, looks an awful lot like play. There are conversations in all of our lives that we have repeatedly. Clearly, I’m ready for winter to be over, already. Beyond those quotidian rants however, there are professional conversations that I’ve had so many time they’re staring to feel scripted. One of those well-rehearsed conversations is about the Arts and whether or not students should be encouraged or even allowed to pursue them past high school. Sometimes the conversation is even about high school courses and whether students “have time” for subjects like Music and Visual Arts in their timetables. In Ontario, students are required to complete one Arts (music, drama, dance, visual arts, media arts) credit during their four years of high school. One. For some students, that’s all they do because that’s all they want to do… and that’s fine. I understand that for those students, the Arts are not going to be where they find their passion and I can accept that. I still think that in the interest of human wellness we should be requiring more than one secondary Arts credit but this particular post is about another kind of student: the kind that wants to pursue more Arts credits but feels that they can’t. The students I’m thinking of are talented in many areas, academically capable, high achievers. They excel at school and beyond. Their horizons are wide open and their futures are bright. Unfortunately, what tends to happen as these students progress through high school and begin to make choices that will shape their career pathways, is that we, the well-intentioned adults in their lives, discourage them from pursuing pathways that we feel are less likely to safeguard their financial futures. We steer them towards maths and sciences because we think that’s where the jobs are. We’re not altogether wrong. There absolutely are job vacancies in those sectors: Statistics Canada reports 28,095 vacancies in professional, scientific and technical sectors in the third quarter of 2017. However, our well-meaning advice is having unintended consequences. In many Ontario secondary schools, teachers refer to the “six-pack” of grade 12 courses that many motivated, university-bound students take in their last year of high school: Chemistry, Biology, Physics (the Sciences), Advanced Functions, Calculus and Vectors, and Mathematics of Data Management (the Maths). That’s a lot of very intense courses to take during one year, and a lot of pressure to be ready for those courses by taking the pre-requisites in grades 9, 10, and 11. Students also have a mandatory grade 12 English credit to complete. It sure doesn’t leave a lot of time to be in the band. People have actually said that to my face: “Oh, my son/daughter/student will never get a job doing that (Art, Drama, Dance, Music) so why would they pursue it?” Keep in mind that I have two degrees in Dance and that I have several jobs that use my Arts training every day. There’s a lot to unpack here. First, there’s the assumption that the only purpose of education is to prepare you for a job. What kind of impact is that having on our kids? Is their only value as income-earners, cogs in an economic wheel? What about their value as humans, as thinking, feeling, creative beings? We wonder why people become less creative as they age while we simultaneously pressure them to abandon the activities that honour and foster their creativity – the activities that make them happy. It shouldn’t surprise us when they fail to develop the skills that we repeatedly tell them don’t matter. Second, people who make this argument assume that students have to make a choice between pursuing the Arts and learning in STEM subjects. Life is long. Most people will change careers several times. What do we gain by forcing students to choose such a rigid path so early? More importantly, how much do we loose? How inflexible does our workforce become when people have been steered so powerfully towards focusing on one narrow thing? How devastating for them when it doesn’t work out. I remember playing Trivial Pursuit with my grandfather, whose degree was in History but who was also a Geologist and prospector. He could answer any trivia question. He could also light a fire in the pouring rain, but that’s another post altogether. We need to foster that kind of flexible thinking and learning in our schools, not squash it by forcing students to make a stark choice. Finally, the most troubling assumption that’s made about learning in the Arts is that the skills we teach aren’t valuable or marketable. People seem to have this image in their heads of a rail-thin starving artist in a cold garret, painting his un-sellable canvases and eating stale bread. That image is so far away from the reality of the artists I graduated with as to be laughable. Some of my former classmates are still pursuing performing careers but many have parlayed their expertise into careers in medicine, education, design, or management. The performers too are rarely doing just one thing; often they’re pursuing multiple career pathways at once… triumphantly. If you want to learn about successful career transitions, ask an artist. All of the skills that we’ve now labeled “Global Competencies” (formerly known as 21C) are taught through the Arts. Critical Thinking and Problem Solving? Ask a theatre company who has to tour a show with an ensemble cast, a modular set, and a shoestring budget. Innovation, Creativity and Entrepreneurship? Ask an independent dance artist who has to write grant proposals, organize a summer dance camp for children, perform and stage her own work, and market herself to festivals. Collaboration? Join an orchestra, a band, or the cast of a play… you’ll be an expert on collaboration. Communication? In the Arts we practice communicating in every way possible: visually, acoustically, linguistically, through body language and movement, among others. When words fail, we step up. Citizenship? Look at any progressive movement in history; you’ll find artists at the forefront, pushing for a fairer, more diverse, better world. Self-directed Learning? That’s our bread and butter. Artists are constantly seeking out opportunities to learn from each other in order to move their practice forward. In the absence of an obvious pathway, we create our own. If you’re reading this post and sensing a certain desperation in my tone, you’re not wrong. I am feeling a little desperate. I’m frightened for our kids. I’m scared and sad for the kids who have enormous potential as artists-in-progress, and are put off pursuing their passions by well-intentioned but ill-informed adults. I’m also afraid for the many students who are struggling with anxiety and depression, whose pursuit of a perfect transcript has left them floundering with no way to express their angst. Put some clay in their hands, give them a brush, or a role, or a trumpet… let them create. Most importantly, don’t tell them that they have to choose. The things they’ll learn in arts classes, be they in high school or beyond, will serve them well for the rest of their lives, whether or not they go on to a career in the Arts as we have traditionally conceptualized it. They will learn exactly the skills they will need to navigate this uncertain world, a world of career changes, entrepreneurship, and acrobatic flexibility. We are a culture in love with the dichotomy but we have to get over it… fast. The world is changing all around us and without these 21C/Global Competencies, we’re going to be left behind. It’s not either STEM or Arts, it’s AND. 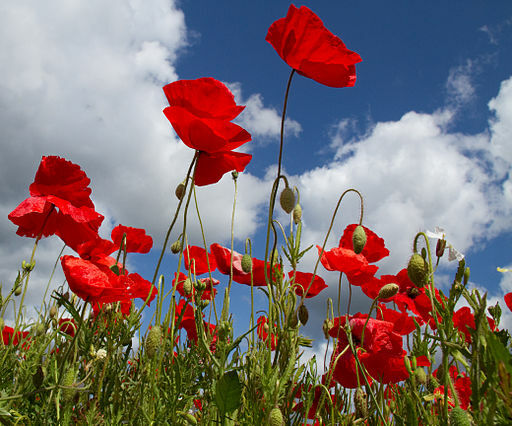 Teaching has a tall poppy problem and it needs to change. One of those easy problems is the tall poppy problem (or syndrome). If you’re not familiar with that expression, it’s one of those fabulously apt British turns of phrase (also popular in Australia). Wikipedia defines it as describing “aspects of a culture where people of high status are resented, attacked, cut down and/or criticized simply because they have been classified as superior to their peers.” While I’m not keen on the term “superior” in their definition, I’m sadly all too familiar with the problem itself; virtually every teacher I know who has moved into a leadership role, whether in their school or in their system has experienced it. When a poppy gets too tall, we cut it down to size. Comments like these, tossed around casually in the staff room or peppering the conversation in the hallway, are the tip of the tall poppy sword. They give new teachers the message that it’s not good to stand out, that it’s better for your social survival to blend in, to be average, to find the middle and stay there. These comments stigmatize striving, they punish achievement, and they disparage risk taking. It’s already scary to take risks, to try new things in your teaching, to put your hand up when opportunity comes knocking; when we normalize comments like this and the social exclusion that often comes with them, we make it even scarier. I am grateful to my dance training for many things but top of the list is that it has made me basically immune to these types of remarks. I get angry about it, sure, but it doesn’t ever stop me. Not everyone, however, spent their adolescence having their every flaw and foible pointed out to them. It toughens you up and it helps you to understand that other people’s opinions are valuable only insofar as you deem them relevant. Feedback is great when it helps you to get better; in that context it’s an investment in your practice whether it’s as a dancer or as a teacher. When its goal is to bring you down, however, it’s not worth paying attention to. While a thick skin is great, and I highly recommend developing one, it’s no substitute for a culture of lifting people up, of celebrating when colleagues are recognized and of supporting each other to take risks, stick our necks out and become ever better. The tall poppies among us should inspire us all to grow, to reach, and to make our classrooms and schools better places for kids and families. We need to start challenging comments that disparage the tall poppies; like all forms of bullying, this type of power play thrives in dark corners. Naming the behaviour when we see it would go a long way towards changing the culture. Cutting people down makes us all worse off and, at a time when we’re encouraging our students to take risks and to find innovative solutions to our many problems, we need to make sure that our schools are places where teachers too feel safe and supported as risk-takers and innovators. We need to grow to meet them; I hear the sun is warmer up there. I was recently working in a busy kindergarten classroom. I arrived to a room full of activity, bustling with energy, teaming with learning. The students were engaged at play, active and joyful with the noise of conversation and materials interacting. 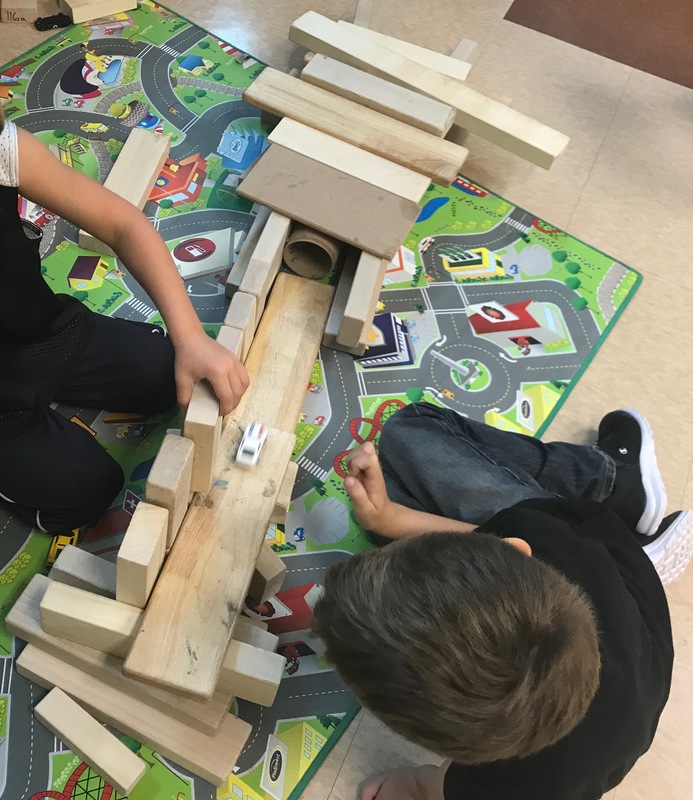 A group of boys had build and obstacle course/pathway and they were challenging themselves to jump between the blocks while staying balanced. Another group was using a mirror to draw self-portraits. Other children were playing with puppets, painting, and reading. If there was one thing I would give new teachers, it would be an awareness of their body language. Women (who occupy the majority of elementary teaching positions) have, in many cases, been taught to take up less space with their bodies, to be quiet and unobtrusive. Good performers take up space. They occupy the room with authority. They plant their feet and square their shoulders. Their spines extend and their heads lift. They don’t fidget; their gestures are purposeful and clear. The maintain eye focus. They make no apologies for their presence in a room. Be aware of your own physicality and what it’s telling your students. What messages are you sending? Is the subtext of your body language sabotaging your teaching? Think about that moment before a concert starts, when everyone settles in and leans forward, straining to hear the first notes. That is a beautiful moment. Dramatic pauses are sadly underused in teaching. There are few techniques more effective than a short pause. To wait. For the next. Word. Try it. A few times in my teaching career, I’ve had parents request that their child sit closer to the front of the class due to challenges with attention, vision, or hearing. These requests have caused me to ask: “Where is the front?” I very rarely stand in one place in a classroom. Unless I’m sitting down, I’m walking. Movement is another way to help students pay attention; it forces them to track you through the classroom and gets them to move in their seats. It also demonstrates confidence and allows you to touch base with every student while giving you something to do if you’re prone to fidgeting. Transitions are the tip of the sword in teaching. They can absolutely ruin a good lesson. Every transition is an opportunity to loose the students’ interest. Think about performances you’ve seen when the scene changes are clunky, when the lighting cues aren’t in synch or when the performers are under-rehearsed. Those transitional moments are agony for an audience. People start to shift in their seats, check their phones, or whisper to their friends… and these are fully grown adults, presumably more capable of self-regulation than the kids in our classes! Practice your teaching transitions, make sure you have all the materials you need, give the kids something to do during the transition, sing a song, tap dance, 7th inning stretch… anything. Being aware of transitions, cutting them back to the bare minimum and smoothing out the ones that remain will make a huge difference to your classroom management.